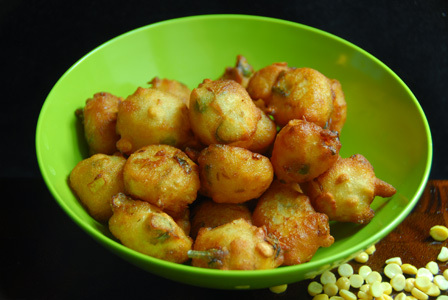 Suggestions: If the inside of the bonda is not cooked properly, put them back in medium hot oil and fry till done. Variations: You can also add a tsp of sooji to make the bonda little more crisp. Other Names: Yogurt Bonda, Challa Punukulu, Challa Punugulu. For a quick yogurt dosa, rice flour and maida are mixed with yogurt into smooth batter along with other spices. The batter is then poured onto hot pan and cooked till the dosa is little brown and crisp. Serve yogurt dosa immediately with any pickle or sambar or any chutney of your choice. Makes: around 8 (8 inch) Easy Yogurt Dosa. Remove stems, wash and coarsely grind the green chiles with salt. In a mixing bowl, mix together rice flour, maida, yogurt, cumin seeds, green chili paste and salt into smooth somewhat thin batter with enough water. When pan gets hot, pour a ladle full of yogurt dosa batter on pan in circular motions. Make sure batter is thin enough that it makes small holes when it hits the hot pan. Try to fill up any big holes and form into 8 – 9 inch diameter dosa. Fry till bottom side starts to turn golden brown. Pour few drops of oil on top and turn on other side. Reduce the heat a bit and cook on this side for 2 -3 minutes before removing from heat. Repeat the same with remaining yogurt dosa batter. Serve instant yogurt dosa immediately with sambar or with any chutney of your choice. Notes: Make sure yogurt dosa is little crisp before removing from heat. Suggestions: If yogurt ratio increases, dosa turns soft and sticks to pan. Add the rice flour and maida in respective ratios to balance the extra yogurt. Its not easy to get the batter right the first time. Test the dosa and make sure it comes out brown and little crisp if thats what you like. If the dosa doesn’t come out of the pan, make sure dosa batter is not too thin. If dosa comes thick, make sure batter is not too thick by adjusting with water. Variations: You can also add finely chopped onion to the yogurt dosa batter. Other Names: Easy Yogurt Dosa, Challa Atlu. 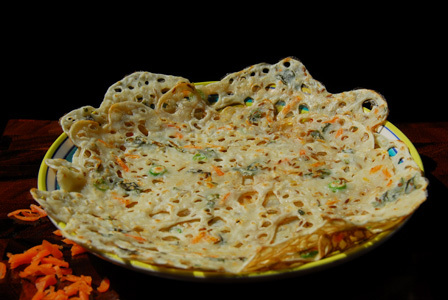 Maida dosa is quick and instant dosa which has to be consumed immediately. Maida is mixed with a little bit of rice flour and spice. The mixture is made into thin batter and poured on hot flat pan into dosa. The maida dosa can be served immediately with mango pickle or any chutney of your choice. Makes: around 6 Maida Pindi Atlu. Remove stems, wash and grind green chiles into paste. In a mixing bowl, mix together maida, rice flour, green chile paste, cumin seeds and salt. Pour enough water to the mixture to make it into somewhat thin batter. Heat a flat pan on medium – high heat, apply few drops of oil on the pan. Pour a ladle full of dosa batter in circular motion around the rim of the flat pan and fill in the large gaps. When the bottom of the dosa starts to change color, turn on other side and layer with few drops of oil. Reduce the heat a little and cook for a minute and carefully remove the dosa onto a plate. Serve maida dosa immediately with any chutney or pickle of your choice. Suggestions: If dosa comes out thick, batter must be too thick. If dosa doesn’t come out well, batter must be too thin so add more maida. Variations: You can also add a tbsp of sooji for a crispier dosa. Other Names: Maida Dosa, Maida Pindi Attu. 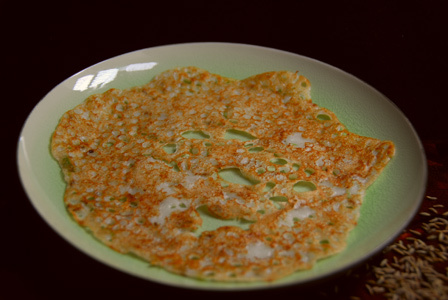 Rawa dosa is a popular South Indian breakfast dosa. It contains sooji and needs no fermentation. Equal ratios of sooji, rice flour and maida / plain flour are mixed with water for rawa dosa batter. A big ladle full of batter is poured on the hot flat pan in circular motions for the dosa. 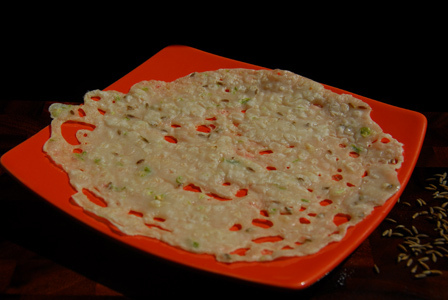 The rawa dosa is generally served with coconut chutney, ginger chutney or with sambar. Makes: around 8 Andhra Rawa Dosalu. Wash and tear curry leaves into small pieces. In a mixing bowl, mix together rice flour, maida, sooji, besan, green chiles, grated carrots, curry leaves, cumin seeds and salt. Add enough water (around 6 cups) and make it into a somewhat thin batter. Heat a flat pan on medium high heat, apply quarter tsp of oil with back of a spoon. When pan gets hot, pour a ladle full of rawa dosa batter on pan in circular motions. Make sure batter is thin enough that it makes holes when it hits the hot pan. Try to fill up any big holes and form into 7 – 9 inch diameter dosa. Pour quarter tsp of oil on top and turn on other side. Repeat the same with remaining rawa dosa batter. Serve Andhra rawa dosa with any chutney of your choice or with sambar. Notes: Make sure rawa dosa is little crisp before removing from heat. Suggestions: If the rawa dosa doesn’t come out crisp, make sure the pan is hot all the time. Don’t spread the batter once it hits the pan. Let it take its time to cook and crisp up. If the dosa doesn’t come out, make sure dosa batter is not too thin. If dosa comes thick, make sure batter is not too thick, else dilute it with water. Variations: You can also add finely chopped onion, ginger or cilantro to the batter. Finely chopped cashews are also commonly added. Some recipes call for more sooji which makes a much crispier version of rawa dosa. Other Names: Andhra Rawa Dosa, Rava Dosa, Sooji Dosa.